Made a little Easter treat for the hubby today to enjoy in the sunshine here in Amsterdam. Getting the benefit of the dates (good for iron levels and digestion) and raw cacao (antioxidants, magnesium, and b vitamins) makes them taste even sweeter! I discovered this recipe on the wonderful Happy Pear website. I couldn't resist giving it a try when I saw the pics. Ideally I'd have had a square cake tin and made it into slices like flapjacks but this was all I had to hand so I made it into a round cake. Still tasted gorgeous! 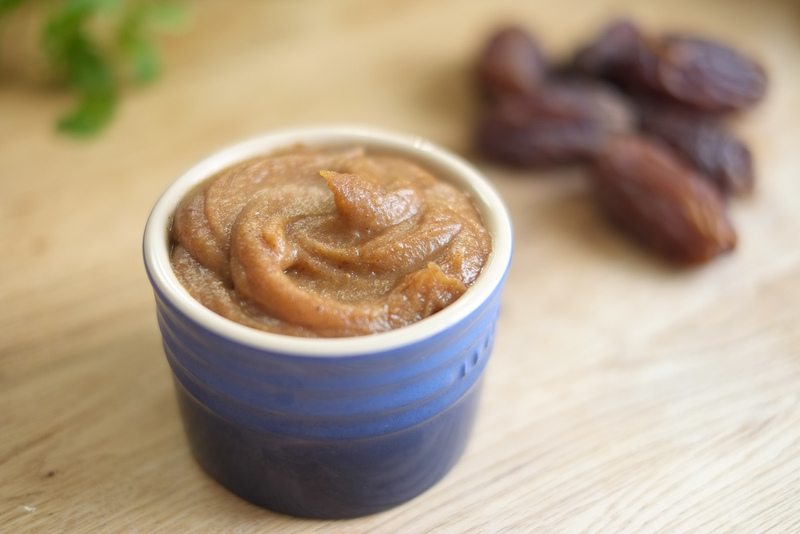 Blend dates for the base in a food processor with a couple of tablespoons of water to form a thick paste. Remove and process almonds and oats to coarse crumb. Add back in date paste with vanilla extract and process until the mixture is nicely combined. Add in water and process until the mix comes together in a clump. Place in a non stick or lined 8 inch square baking tray. Spread out evenly using your hands. For the centre blend together dates, almond butter and almond milk. Spread over the base and place in the fridge to harden a little for about 30 minutes before you top with the final layer. Melt chocolate and coconut oil together. Stir well to ensure it’s melted and combined before pouring over the base layers quickly spreading and returning to the fridge to set for an hour before serving. Allow to soften a little at room temperature before slicing to avoid cracks in the chocolate. 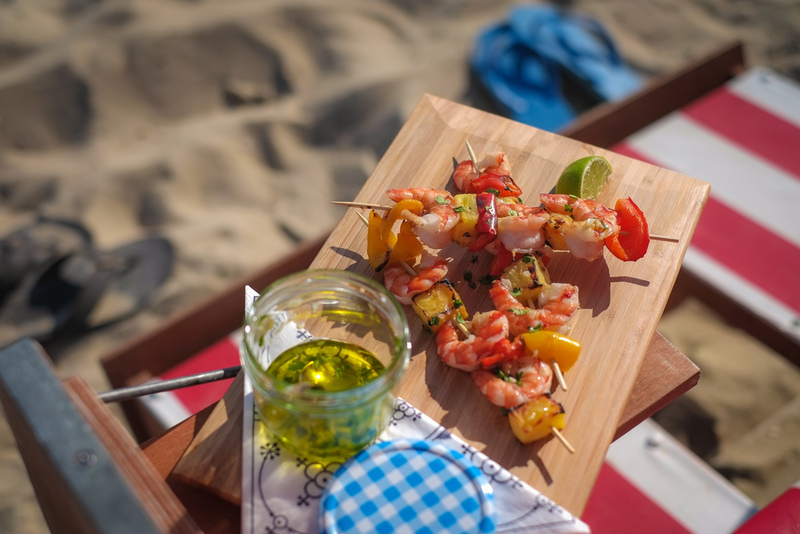 Spending all day on the beach can leave me feeling quite peckish, so I made these for a lunch treat to have at my beach basket. Besides prawn, I've added pineapple, which contains anti-inflammatory bromelain and vit C, and some of my favourite fresh herb coriander (potassium, iron, calcium, magnesium). I normally eat a mainly plant-based diet, but decided to try some seafood whilst here at the sea. 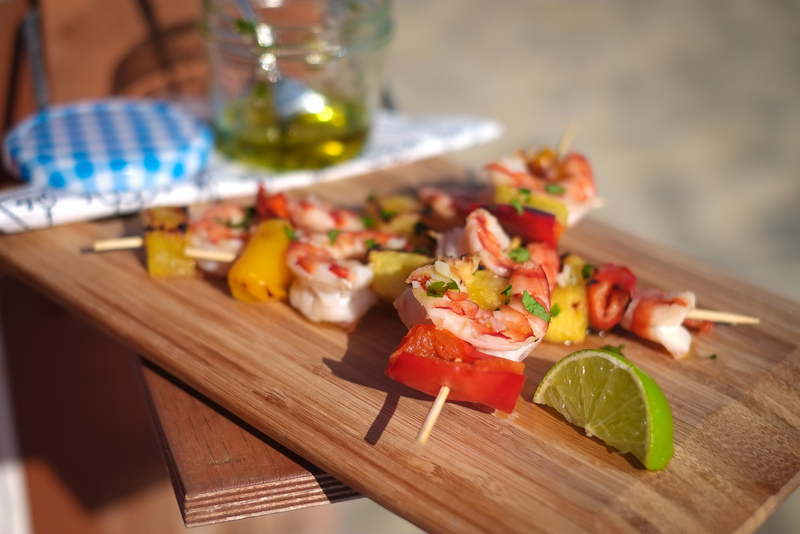 Always be mindful when eating seafood to buy sustainably sourced and avoid farmed. 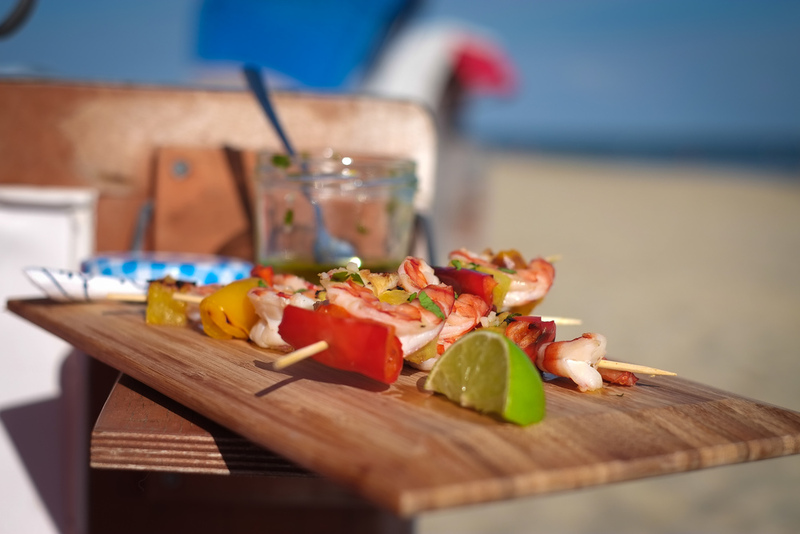 Grill the prawns, peppers and pineapple and place on skewers. Season lightly. Mix some freshly chopped coriander and lightly cooked chopped garlic in some olive oil as the dressing. 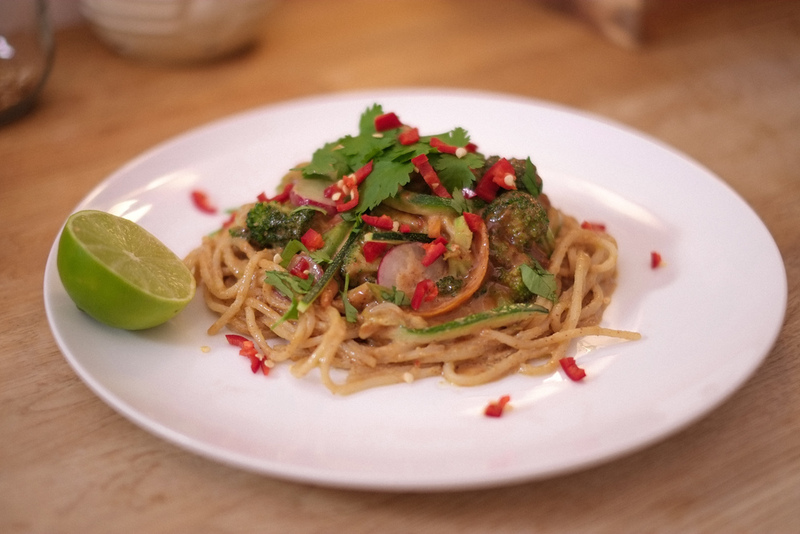 Sprinkle coriander on top to garnish and squeeze some lime. Sometimes in the morning I don't have time to whip up a big breakfast, and this is my favourite go-to quick and easy healthy option when I'm in a hurry. Packed with pumpkin seeds (zinc for healthy hair and skin), Chia seeds (Omega 3 fats and tryptophan, good for mood and sleep) and many more. This is so easy to make when you are in a hurry and want something simple and healthy. I just pop my favourite nuts, seeds and berries in a bowl with a splash of maple syrup and some normal or dairy-free yoghurt. Usually I use coconut yoghurt. The two main ingredients of store-bought Nutella are white sugar and palm oil (disguised as vegetable oil). Palm oil is not only bad for your health, but palm oil plantations are currently the leading cause of rainforest destruction in Malaysia and Indonesia. Plus: the benefits of making your own are more cacao (full of antioxidants) and hazelnuts (rich in vit E, magnesium, potassium and calcium). 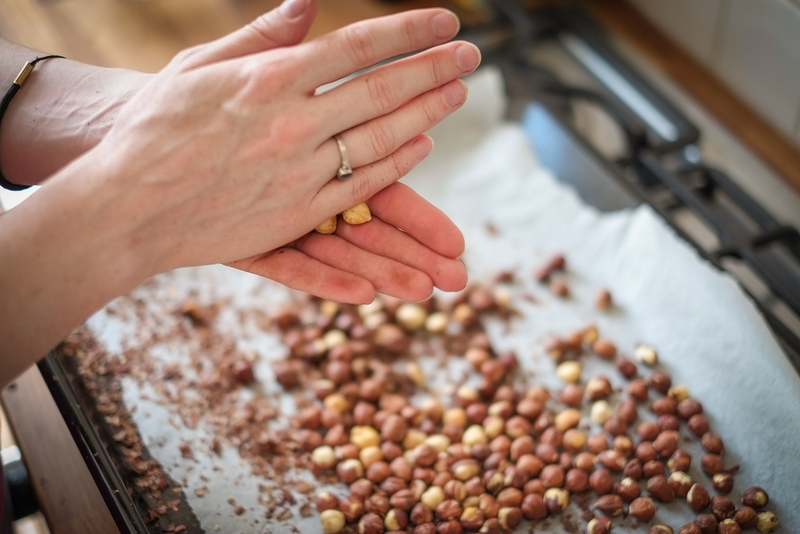 Toast the hazelnuts for around 10-15mins in an oven at 175c, the skin should be flaking off them. Once cooled a little you have to remove the skins, you can achieve this by rubbing them together in your hands and the skin should just fall off. 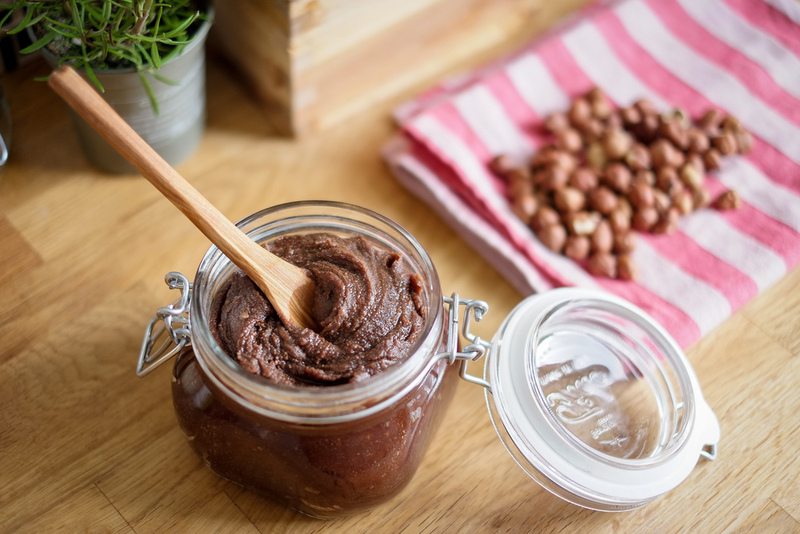 Place the hazelnuts in a food processor and blend, then add the oil, maple syrup, salt and cacao. Blend together until a smooth texture. You can add more oil if it's a little dry. It should be spreadable. Buckwheat pancakes are also known as Galettes de Sarrasin. 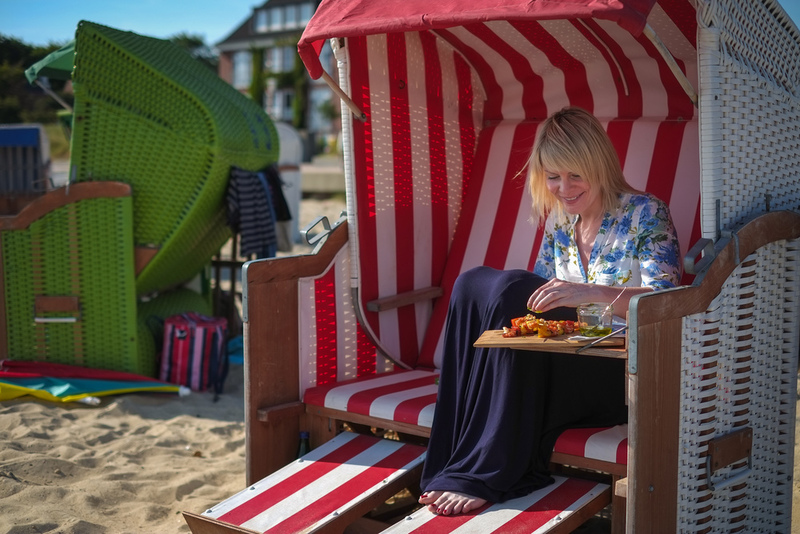 They are the traditional style of savoury pancakes in Northern France. The bonus of using buckwheat flour is that it's gluten free. Buckwheat is no relation to wheat even though the name suggests so. It has a high protein content and contains iron, selenium and zinc. It is also being studied for its use in treating type 2 diabetes, cholesterol and gallstones. The main ingredient in the fudge is dates. I love their natural toffee flavour and love their high mineral and fibre content even more. 2 cups of pitted dates (soaked for 2 -3 hours). Try and find medjool dates if possible. Place all ingredients in the blender and slowly add water until you reach desired consistency. You can add maple syrup, coconut oil and lemon juice as desired until you reach the taste you prefer. Mix all ingredients together until a smooth batter. Place pan on medium heat and cook for 1-2 minutes on each side or until golden. If the pancakes are sticking too much to the pan just add a little more oil to the batter. Coriander is one of the worlds oldest spices and its use can be traced back to 5000 BC. In some parts of Europe it is referred to as the 'anti-diabetic' plant. This is due to its blood sugar lowering properties. It's also shown to be anti-inflammatory and helps lower cholesterol, so try get it into your diet more often to get some of these great benefits. You could start with this easy chutney. I used a spiralizer for the courgette spaghetti but you can slice it thinly if you don't have one. One important thing to remember when cooking lentils is to soak them overnight first. They are relatively high in phytates which are enzyme inhibitors. These can affect absorption of minerals in the body like calcium and zinc. If you soak them overnight, you remove most of the phytates improves your digestion and mineral absorption. Place the lentils in a small pan, cover with water and bring to the boil then simmer for 10-15 minutes until al dente. Drain and set aside. Heat the olive oil in a large pan and squash the tomato into the oil to make a base for the sauce. Add the garlic and beetroot with the tamari, chives and cumin. Add the water and cook over a medium heat for 15 minutes, or until reduced to a thick sauce. Add the lentils to the pan with a splash more water and simmer for a further 5 minutes. Season to taste. Layer half the butternut squash and a third of the courgettes in an ovenproof dish and spread over half the lentil sauce. Repeat the layers, finishing with the remaining courgettes. Brush the courgettes generously with olive oil, then bake for 45 minutes, or until the vegetables are just tender. I don't normally cook lentils but this week I've been trying out lots of recipes from the Honestly Healthy cookbook for their alkaline plan. It's been an interesting food adventure to say the least and I've definitely spent more time in the kitchen than usual. This recipe was really tasty and definitely one of the more simple dishes in the book. 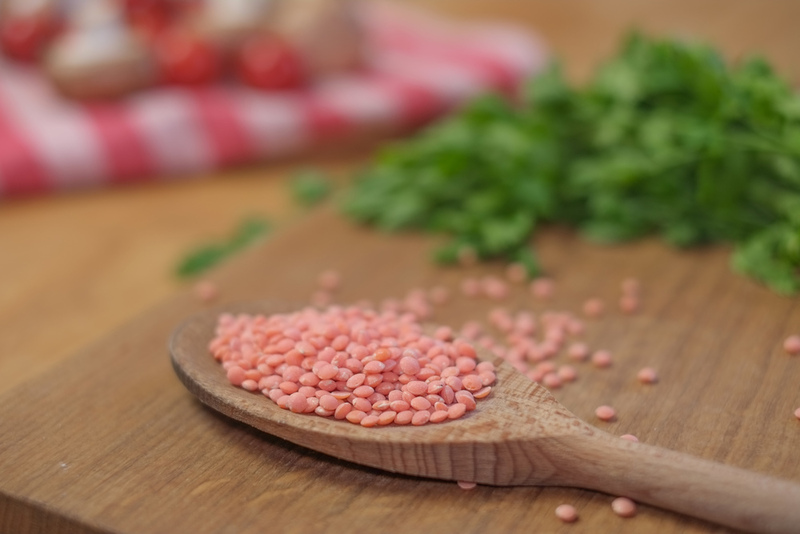 The lentils are a great source of plant protein and iron but it's important to remember to soak them overnight before you use them to reduce the phytate content (phytates reduce the bio-availability of dietary minerals). Sauté the onion and garlic in the olive oil for 2 mins. Stir in the dried parsley, coriander, cumin seeds, tomatoes and mushrooms with a good splash of the water. Allow to sweat until the tomatoes start to split and the water is absorbed. Stir in the lentils, chilli and 400ml of the water and cook over a medium heat for 25-30 minutes, adding the remaining water a little at a time as necessary until the lentils are cooked and reduced to a mushy consistency but still hold their shape. To serve, stir in the fresh coriander, parsley and spinach. I learned this recipe from the chef David Bailey in London. It's amazing! I think my boyfriend is addicted to it. Luckily it's got lots of goodness in the form of dates (potassium, iron, flavonoids) and almond butter (vit E, vit B2, phosphorus ). Blend everything together in your food processor adding a little water to thin if necessary. You can add it to selection of raw or cooked vegetables and some noodles. Works well with both. Healthy living for mamas and their families. We show you how to prepare simple, delicious food and make natural lifestyle choices that are good for your body, health, and vitality. We work with qualified nutritionists, lactation consultants, doulas, reflexologists, and other wellbeing experts.